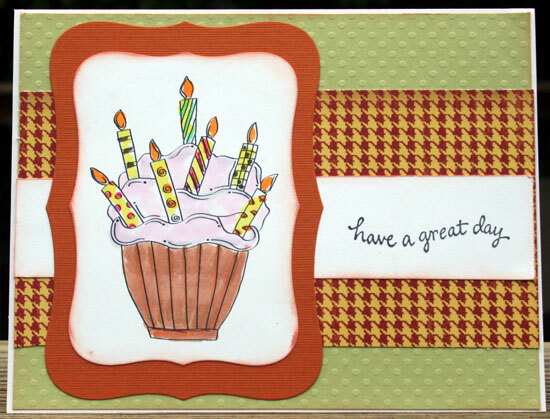 This birthday cake image from Blackleaf really caught my eye. I love how whimical it is. So I chose to color it with my Copics and added some Spica pens for glitter. AND this is my creation. 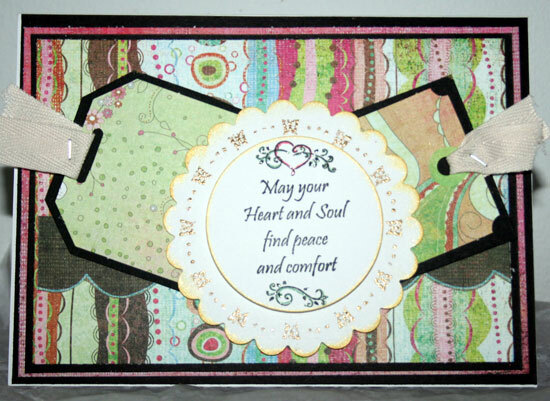 I used Justrite Stampers Thinking of You Borders and Centers lots of Basic Grey and Nestabilities. 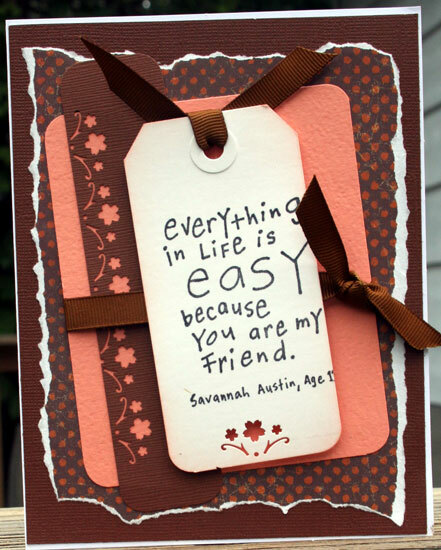 Rather than using it as an oval sentiment, I chose to use it as a circle, adding some embossing and using Spica pens. I'm a little late in getting this post up. I was having computer issues yesterday. 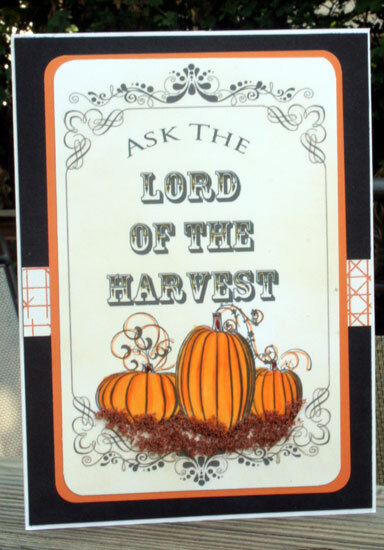 But the DT were challenged to use the "Lord of the Harvest" image from Sugar Creek Hollow this week. I love this image and love what everyone was able to do with it. Hope you have the chance to check them out. My latest DT project for Scrappin Sports Stuff combines an assortment of products found only in the store , along with my Cricut cartridges. 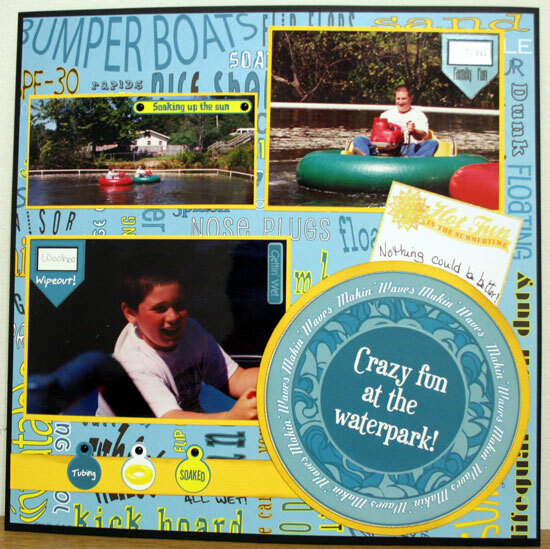 Don't forget to check out the store for all your scrapbooking needs. 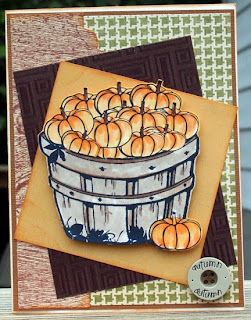 I've got a card on the blog today with punch 921 again. Can you tell I love this wonderful punch!!!! It's just so versatile and easy to use. Using insert A I created the borders. 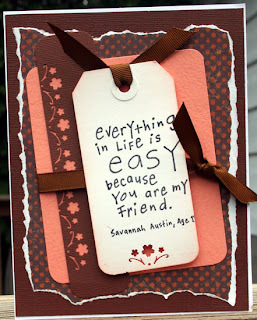 I chose to use it to add a little life to a stamped tag as well as add a border around the tag. 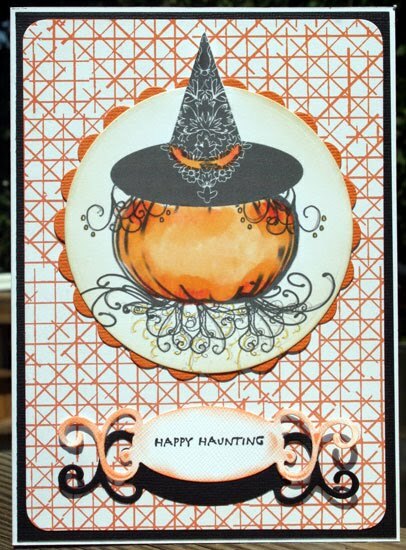 The challenge at Justrite Stamps this week is a color challenge. We are to use dark red, ivory & black, with the added twist of creating our own handmade embellishment! 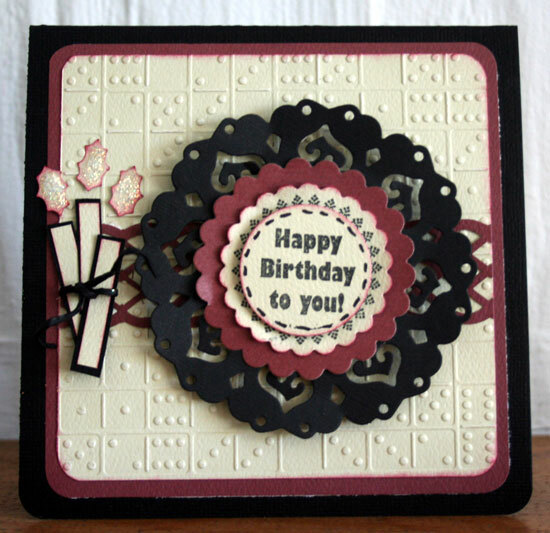 This was definitely a fun challenge and I created this birthday card, using my Justrite Big Occasions Centers & Borders stamps along with Spellbinders Pendant die and circle dies. I added a stitching line around my sentiment before pop dotting it on the outer ring. I made candles from the paper scraps and wrapped them with some twine, adding punched holly leaves for the candle flames onto which I added some stickles. 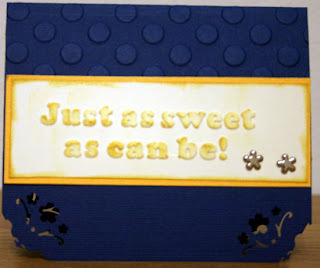 The background was embossed with the Cuttlebug Dominos embossing folder across which I added another punched piece. It's another beautiful day at Sugar Creek Hollow. Come play along with this week's challenge. 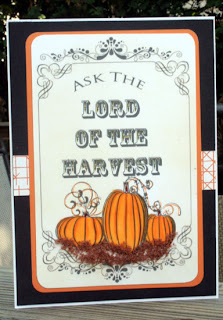 I love this digi image so I chose to add some red Spica pen to the flourishes and the letters to give it a bit of glimmer. The hat was cut with Spellbinders Halloween die, and some buttons were added for dimension. Hi there, it's my turn to showcase new punches on the Just Imagine blog. 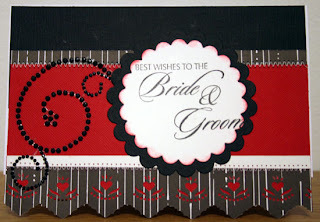 On my cards, I used punch 921 as corner embellishments. 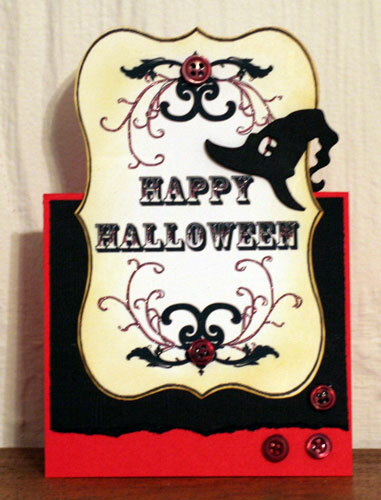 They turn a plain card into something quite remarkable, plus they are so much fun to use. I used insert C to create the corners on Sweet and I used insert B to create the corners on Enjoy. I also used it for the mat around my stamp. The challenge at Justrite Stamps this week is to create gift tags. 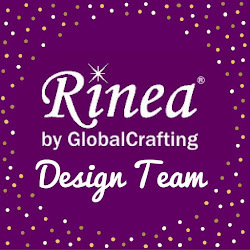 Now that we are heading towards the holidays, it's the perfect time to start created holiday projects and all projects need gift tags. 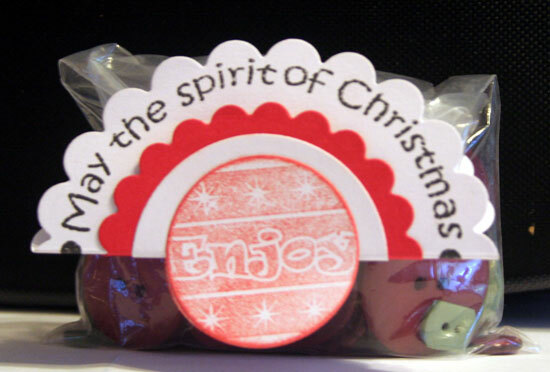 I used Harmony Classic Circle Stamper II and Christmas Stamp Ensemble along with my Nestabilities. 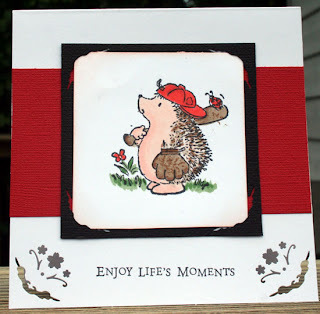 I stamped ENJOY two times with Memento red ink and die cut them with a Nestability circle die. I stamped the large phrase with Memento black ink and die it with the large Scalloped Nestability circle. Folding this is half to fit my bag, I added ENJOY to both sides. 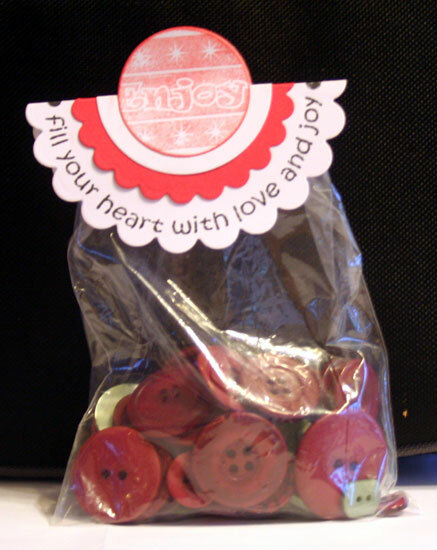 I'm thinking this would be a great gift for someone who loves to sew or craft. Then perhaps I'll make a some with Christmas candies inside for those who have a sweet tooth or two! Just Us Girls is hosting a challenge this week that is sponsored by Justrite Stamps. How awesome is that. The technique to use was cracked glass, something I've wanted to try but didn't until now. A wonderful tutorial on how to accomplish cracked glass is found here . 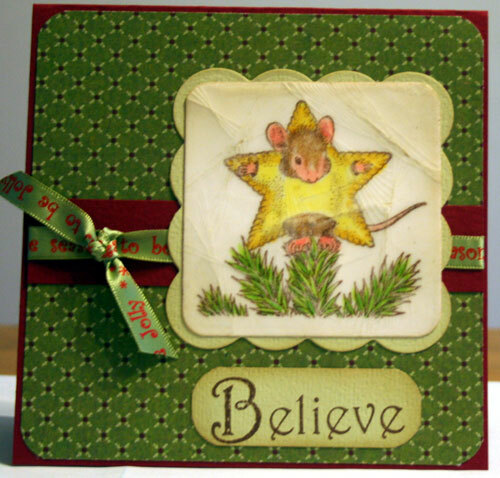 I stamped my House Mouse image and colored it with Copic markers. Then I sponged the edges with Ranger Antique Linen. I used 6 layers of American Crafts Zing embossing powder. Placed it in the freezer for a minute or two, then bent the image until I got the cracks I liked. Then I sponged over the image with Ranger Antique Linen again to get ink in the cracks. 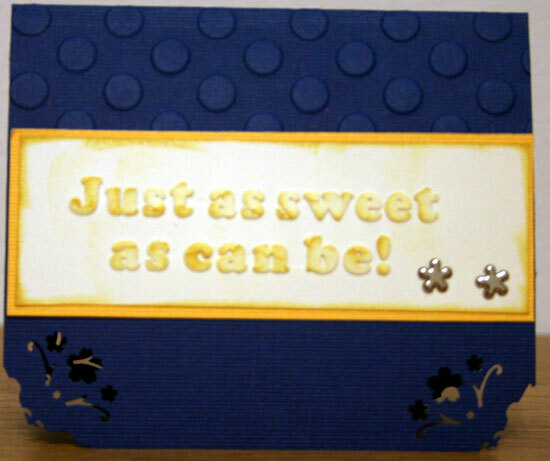 I used the Spellbinders Square and Scalloped Square Nestabilities, added a sentiment from Justrite Stamps along with papers from K&Co., then assembled my card. Love this digi image from Sugar Creek Hollow. It's called Baby Jacks and there are so many possibilities with this image. After printing it out, I colored it with assorted Copic Markers, then just cut it out and positioned it on my card. Check out Sugar Creek Hollow for more amazing ideas. There's a new challenge at Justrite Stamps this week. They want to see glitter and oh my, I get glitter everywhere!!!!! 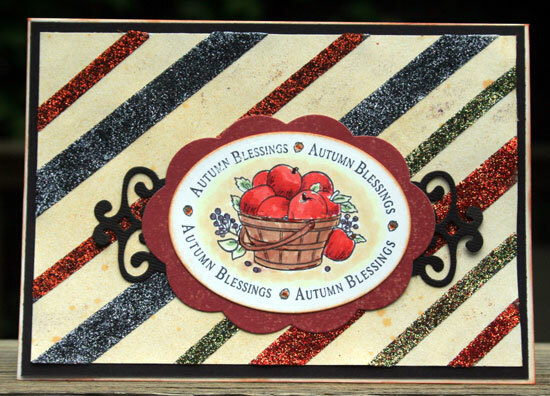 I chose to use Autumn Blessings set , adding color with my copics. I used my Spellbinders dies for the frame and the labels. For my background, I used a sheet of white cardstock and added 2 sizes of red line tape across it. I then sprayed it with Candlelight Glimmer Mist. The tape resisted the Glimmer Mist and when dry, I pulled off the tapes individually and covered each line with glitter. I had glitter everywhere, but it was so worth it. 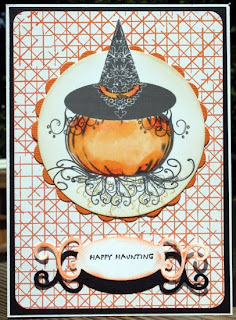 I love how this card turned out!!! 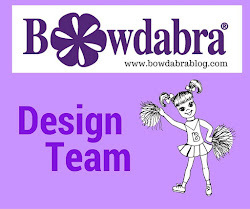 I am just so excited to have been selected as a new DT member at MyStampbox for the upcoming term. I can't wait to get started with the wonderful stamps and the amazing designers at MyStampBOX. 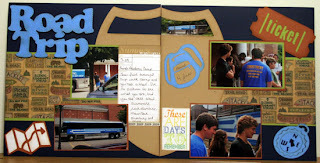 Check out Scrappin Stuff's blog today. My Water Fun DT project is featured. Scappin Stuff has so much to offer in themed related products. I had so much fun with this layout. We are just a few weeks away to the official start of fall. To celebrate, we are kicking off the season today at Sugar Creek Hollow with some fantastic Fall Digis and a Brand New Design Team. Come take a look at who's in the team. They have some great cards to show you using the latest digis. Then, make sure to visit the store to purchase any of these great digis. We even have some Vintage gift ideas you can purchase. Can I say just how excited I am to be part of this amazing team. 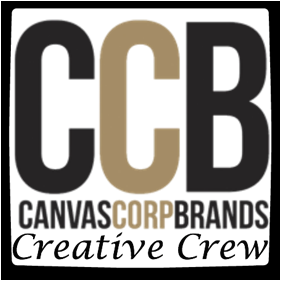 Be sure to check out everyone's projects, you will love them! I used this wonderful pumpkin image. After printing her, I colored her with my Copics and added some Spica pen for effect. Using my Nestabilies I cut circles for the image and tags for my sentiment, turning one upside down on top of the other. Hope you find her as adorable as I did. 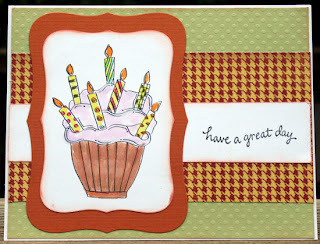 It's my day to post on the Just Imagine blog and I wanted to show you a fun card I created with my new punches - #911. I love the fact that these punches are so versatile and so easy to use. 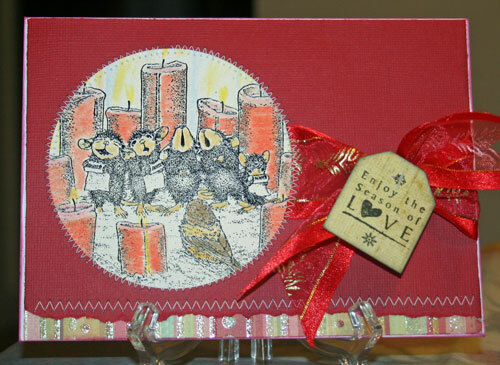 My Cocoa card is featured on the House Mouse web site. My Music card is also posted . 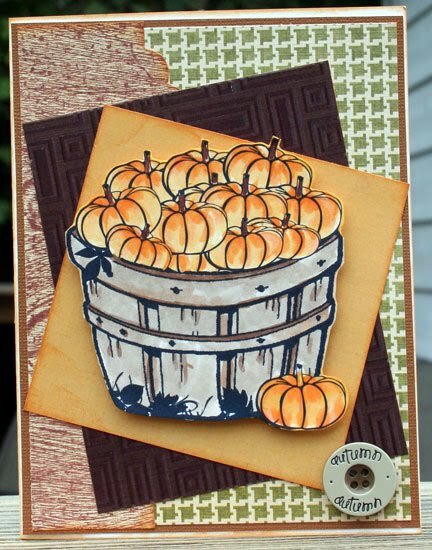 It's almost time for a blog hop with the Sugarcreek Hollow design team. Check in on Saturday and see all the new digis available.